Carly Carlson Photography | BLOG | Baker City Eastern Oregon Senior & Wedding Photographer: PROM MINI SESSIONS! | Sign up now, slots will fill up FAST! PROM MINI SESSIONS! | Sign up now, slots will fill up FAST! You don't have to get the traditional prom pictures! Instead, book a completely custom, totally fun mini-shoot with CCP! slots are already filling up so book ASAP! Individual, couple, or group sessions give you tons of options. Don't have a date, but want awesome prom pics? Go solo for an individual shoot- hey, you're getting all dressed up right?! Or better yet, get a huge group of friends together for a crazy group session. And couples, guess what? No "prom poses" here. Each session will be unique, you'll have a dozen photos to choose from, and you'll have no lines to wait in for your photos! Sessions will take place downtown and will have an urban vibe. We'll get a variety of posed and candid pics for you to choose from. Plus, you can order a variety of poses to fill your print package, and you can add as many additional prints as you'd like with the purchase of any print package. 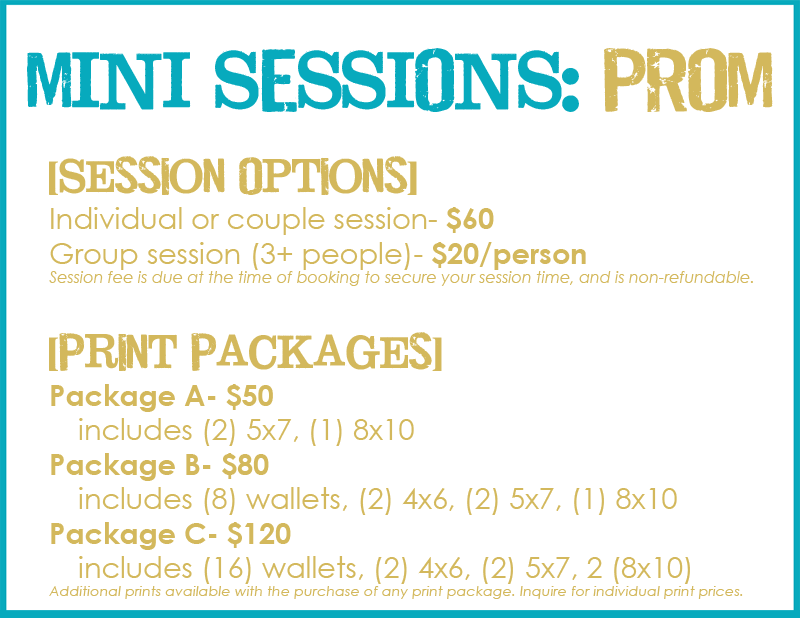 Choose your session type & your print package, then call me to book your session! To book your own prom mini-shoot, call Carly @ 541-519-1957.